Elio Fox is Your 2011 WSOPE Main Event Champion! 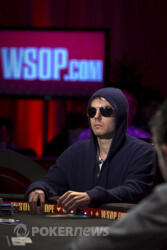 Congratulations to Elio Fox, 2011 WSOP Europe Main Event Champion (€1,400,000)! The 2011 World Series of Poker Europe has come to a close with the conclusion of the €10,400 Main Event Championship. It was an absolutely amazing series capped off by Elio Fox becoming victorious in the Main Event and earning the massive €1,400,000 first-place prize. Back on Saturday, October 15, this prestigious event kicked off and 310 players came out for Day 1a. On Day 1b, another 283 players joined the mix to take the grand total of entrants all the way up to 593, easily making it the largest WSOP Europe Main Event in history. The amazingly large field generated a prize pool of €5,692,800 and the top 64 places were to be paid out. The eight players to make the final table would have a chance at €3,890,000 of that prize pool and coming into the final day, Elio Fox headed the bunch. The first player eliminated on the day was Britain's Max Silver. He was followed out the door by Jake Cody, Shawn Buchanan, Dermot Blain, Brian Roberts and Moritz Kranich in that order, leaving just two players to duke it out for the bracelet. The heads-up battle for the title came down to American Elio Fox and Brit Chris Moorman. When the match began, Fox held the lead with 11.095 million in chips to 6.72 million. About 20 hands into heads-up play, Fox took a big chunk from the stack of Moorman. Fox had the button and he raised to 200,000. Moorman called. The flop came and Moorman checked to Fox who bet 250,000. Moorman took his time and raised the action to 625,000 and Fox made the call. The turn was the interesting and Moorman kept up his momentum with a bet of 950,000. Fox remained seemingly unfazed with his fists clenched tightly underneath his mouth; he grabbed for chips and made the call. The river was the even more interesting and Moorman pulled back on the brake a little bit with a check. Action moved to Fox and he also checked and we had a showdown. Fox showed the for the tiniest of flushes and Moorman mucked his hand. On the final hand, Fox had the button and raised to 200,000 with the blinds at 50,000/100,000/10,000. Moorman three-bet to 430,000 and then Fox shoved all in. Moorman called it all off and it looked like he had a little over two million in chips left. He held the and was dominated by Fox's . The flop was interesting with the falling. The turn brought the and gave Moorman some outs to a chop. When the river landed with the , it was all over with and Fox was the champion. For his finish in second place, Moorman took home €800,000. Congratulations to all of the winners and especially to Elio Fox for his victory in the 2011 World Series of Poker Europe Main Event. 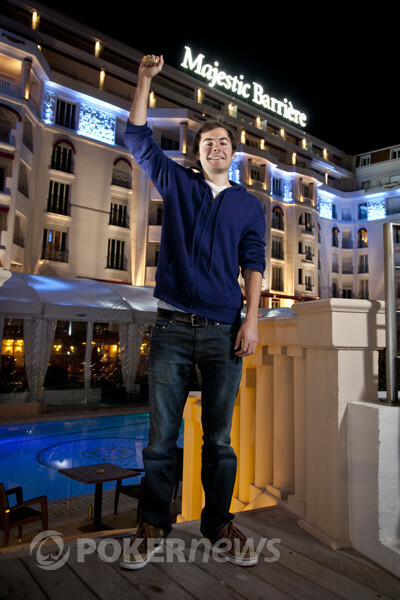 That wraps up PokerNews coverage from Cannes, France for this amazing series, but the WSOP still has one more event to finish off for 2011. Join us in a couple weeks for the WSOP Main Event November Nine live from Las Vegas, Nevada. We'll see you there! Hand #201: Elio Fox had the button. He raised to 200,000, and Chris Moorman three-bet to 430,000. Fox responded with a shove, and Moorman made the call for his tournament life. It looked like he had about 2.1 million chips left, and they were now all committed to this pot. And as the cards were turned up, the news was not at all good for the Brit. For the first time in 11 hours, the atmosphere in the room became electric as everyone scrambled around to find a line of sight. Some ran to the television screens, others flooded the perimeter of the stage, craning their necks to catch a glimpse of the decisive flop. The dealer spread out , and that was a fantastic sweat. A chorus of nervous chatter coursed through the studio as Moorman picked up another four outs to fill in the gutterball. The turn came the , and that was another sweat. If he had to miss fourth street, the board pair was a good way for Moorman to do it. Now he could catch a three or a four to chop, or a five or seven to win. Thirteen outs once seems like an awful lot for a guy who runs like Chris Moorman, but it just was not meant to be today. That's clean and safe for Fox, and it's the card that's put the bracelet on his wrist here in Cannes! It's hard to be disappointed when you've just earned €800,000, but Moorman was clearly frustrated with the way his day ran out over the last couple hours. He was closing in on half the chips in play at one point, and you'd have been a fool to bet against him, even when he started leaking a bit. We know we wouldn't want to face him heads-up for a bracelet, but Fox looked him up with the confidence of a true champion, jabbing away at the little pots and landing every big punch he threw. Moorman will have to settle for second place today, and the cash he'll collect should eventually help to take away some of the sting. It's been another fine run for he and the Brits here this week. Hand #192: Chris Moorman was on the button and Elio Fox got a walk. Hand #193: Elio Fox was on the button and he raised to 200,000 and Chris Moorman folded. Hand #194: Chris Moorman was on the button and Elio Fox got another walk. Hand #195: Elio Fox was on the button and raised to 200,000, Chris Moorman raised to 500,000, Elio Fox moved all-in and Moorman snap-folded yet again! Moorman's chip stack is dwindling as Fox retains control of this HU encounter. Hand #196: Chris Moorman raised to 200,000 and Elio Fox folded. Hand #197: Elio Fox raised to 200,000 and Chris Moorman folded. Hand #198: Chris Moorman raised to 200,000 and Elio Fox decided he wanted to see a flop. The flop was and both players checked. The turn was the and Fox bet 250,000 and Moorman folded. Hand #199: Elio Fox had the button and raised to 200,000 and Chris Moorman folded. Hand #200: Chris Moorman had the button and he raised to 200,000. Elio Fox pulled his chips back into roost and replaced them with a bigger bet of 460,000 and Moorman folded. Hand #186: Chris Moorman had the button, and he raised to 200,000. Elio Fox defended, and the flop came . Fox checked, Moorman bet 200,000, and Fox would go no further. No jack-deuce this time, it seems. Hand #187: Elio Fox had the button. He raised to 200,000 and took it down. Hand #188: Chris Moorman had the button, and he raised to 200,000. Elio Fox reraised to 525,000, and Moorman folded out of the way. Hand #189: Elio Fox had the button, and he raised to 200,000. Chris Moorman folded. Hand #190: Chris Moorman had the button, and he gave Elio Fox a walk. Hand #191: Elio Fox had the button, and he raised to 200,000. Chris Moorman took a longer-than-usual pause, and that usually means a reraise here. Indeed, he added some more to the bet and made it 500,000 total, but it would not get through. Fox announced an all-in four-bet, and Moorman gaped at the move. His eyes got all wide for a moment, but not in the good way, and he shook his head and folded. Hand #185: Elio Fox had the button and he raised to 200,000 and Chris Moorman called. The flop had more clubs in it than Soho - - and Moorman checked to Fox who bet 250,000. Moorman took his time and raised the action to 625,000 and Fox made the call. 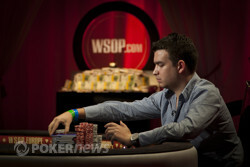 The turn was the interesting and Moorman kept up his momentum with a bet of 950,000. Fox remained seemingly unfazed with his fists clenched tightly underneath his mouth; he grabbed for chips and made the call. Going to the last card and someone was going to be disappointed. The river was the even more interesting and Moorman pulled back on the brake a little bit with a check. Action to Fox and he also checked and we had a showdown of epic proportions. Incredibly Fox won with his making him a flush and Moorman is down under 5 million now. Hand #175: Elio Fox had the button. He raised to 200,000, and Chris Moorman folded. Hand #176: Chris Moorman had the button. He opened to 200,000 himself, and Elio Fox defended his big blind. The flop came , and Fox checked to the raiser. Moorman repeated the same 200,000, and Fox folded. Hand #177: Elio Fox had the button, and he raised the minimum again. Moorman came along to the flop this time, and Fox bet 225,000. He was called without too much delay, and Moorman checked the turn as well. Fox kept the heat on with another 550,000 chips, and Moorman stared down at the board for a minute. Then, he folded. Hand #178: Chris Moorman had the button, and he raised to 200,000. Elio Fox placed one more plaque into the pot to see the flop, and it came . When Fox checked, Moorman bet 200,000, and he won the pot with no drama. Hand #179: Elio Fox had the button, and he gave Chris Moorman the first walk of this heads-up duel. Hand #180: Chris Moorman had the button, and a raise to 200,000 earned him the pot. Hand #181: Elio Fox had the button, and this time he raised to 200,000 to win Moorman's big blind and ante. Hand #182: Chris Moorman had the button, and he raised to -- you guessed it -- 200,000. Elio Fox called this time, and the flop came . Check-check, and the landed on the turn. Fox led out with 260,000 there, and the put three threes on board. Fox froze in his thinking pose for about a bit before checking, and Moorman began stacking out chips. He threw 420,000 of them into the pot, and Fox couldn't call. Hand #183: Elio Fox had the button, and 200,000 was enough to end the hand. Hand #184: Chris Moorman had the button, and he opened to 200,000. Elio Fox pulled back his blind and slid out a reraise to 550,000 total. Moorman only spent about 20 seconds mulling it over before making the call. The flop came , and that's a c-bet flop. Fox put out 525,000, and Moorman ducked out. Raise, Re-Raise and Re-Re-Raise - HU Starts With a Bang! Hand #168: Chris Moorman had the button in the very first hand of heads up action and his first raise of 175,000 won the pot. Hand #169: Elio Fox had the button and he raised to 160,000 and Moorman folded. Hand #170: Chris Moorman started from the button and he raised to 175,000. Elio Fox made the first three-bet of the heads-up action when he re-raised to 475,000. The Moorman fans were filling the rail as he went through his decisions in his mind. He then four-bet to 950,000 and Fox folded very quickly. Hand #171: Elio Fox had the button and he raised to 160,000. Moorman continued his assault on the Fox stack with a three-bet of 460,000 and Fox folded. Hand #172: Chris Moorman had the button and he made it 165,000 to play. The reaction of Elio Fox was to three-bet to 480,000 and Moorman four-bet to 960,000. Fox decided to take a stand and moved all-in and Moorman folded. Hand #173: Elio Fox raised to 160,000 on the button and Chris Moorman made the call. The flop was and Moorman was first to bet and Fox folded instantly. 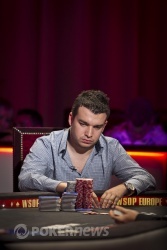 Hand #174: Chris Moorman raised to 165,000 on the button and Elio Fox folded.